Kinder Morgan announced a final investment decision today on its $7.4 billion Trans Mountain Expansion Project (TMEP). The company says it has now secured enough "satisfactory financing" to commence construction activities. Part of that financing includes spinning off its Canadian subsidiary Kinder Morgan Canada Limited (KML). The company now plans to issue 102.9 million shares at $17 a share, for total gross proceeds of $1.75 billion. That was revised lower from an initial IPO plan to issue up to 90 million shares at $19 to $22 a share. The IPO represents a 30% stake in KML. Parent company Kinder Morgan will retain a 70% ownership in its Canadian subsidiary in the form of 242 million Special Voting Shares. The deal would value KML at about $6 billion, revised lower from an earlier estimate of almost $7 billion. The shares should begin trading on the TSX early next week. 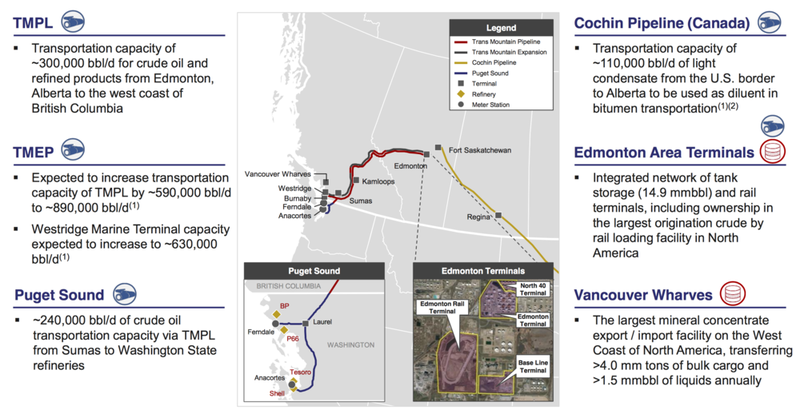 Aside from TMEP, KML also includes the Puget Sound and Jet Fuel pipeline systems, the Canadian portion of the Cochin condensate pipeline, the Vancouver Wharves and North 40 Terminals, as well as joint ventures in the Edmonton Rail, Alberta Crude and Base Line Terminals. TMEP will transport an additional 590,000 bbl/day of Alberta crude to tidewater in Vancouver and refineries in Washington State. The pipeline is oversubscribed, with over 80% of capacity booked on 15 and 20 year take-or-pay contracts, and the remaining 20% left open for spot volumes. Customers that have booked on the expanded line include BP, Suncor, Total, Brion Energy, CNRL, Cenovus, Imperial, Tesoro, Husky, Devon, MEG Energy, Teck and Athabasca Oil Corp.
Once the expansion is completed, the Trans Mountain line will have a total capacity of 890,000 bbl/day. Kinder Morgan says it has already spent $1.2 billion on the project, leaving $6.2 billion to be spent over the next two years. If all goes according to plan, the line could be in service by the end of 2019. The company admits the political climate is "not ideal" but the project needed to go ahead since financing was the final outstanding condition for the shippers contracts.